A Medieval silver penny of Edward IV (AD 1461-1483). Obverse depicts the king facing, with a key at the right side of the neck. Reverse is long cross with three pellets in each quarter and quatrefoil with pellet at centre. Clipped and worn. It has a diameter of 15.3mm, a thickness of 0.6mm, and weighs 0.6g. Obverse description: King facing with key at right side of neck. 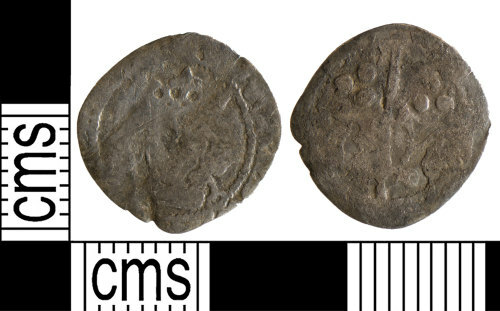 Reverse description: Long cross with three pellets in each quarter. Quatrefoil with pellet at centre of cross. A clipped and worn silver penny of Edward IV, 1461-1483. The mint is unclear. A silver penny, possibly of Edward IV (AD 1461-1483) and probably from York Episcopal mint (key to right of bust). Clipped.